You may not have explored any Swift syntax yet, but you can still experiment with it. Here, you learn how to test the results of a line of code in a playground, and then how to check the syntax of your code within a playground. The results of any code you type into the playground can be seen more or less instantly. To illustrate, begin with the playground shown here. Add a line to change the value of str to “Another String” as shown. Look at the sidebar to see the new value. If the value is what you expect, you’re done (and you’re successful!). If nothing changes in the sidebar (that is, if no value appears or if the original value there remains unchanged), check for a syntax error. If the playground can’t interpret your code, it’s not going to execute it. If you see the wrong result, check your code. A flaw in logic may have given you the wrong answer. Depending on your Mac’s processor speed, the other apps or processes you have running, and the complexity of your code, there may be a delay while Swift parses and then executes the code. 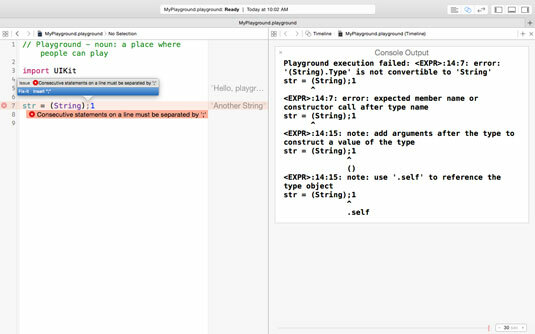 At least in early versions of playgrounds in Xcode 6, some developers reported that it was sometimes necessary to give the playground a little nudge. Changing your code a little (such as deleting a word or two and then adding it back in) may cause the parser to be reinvigorated. Open the Assistant (the two overlapping circles at the top right of the window shown here). The listing shows the completed code you create in your playground. This opens a second pane in the playground, just as it does in Xcode editing windows. If you don’t see the overlapping circles, choose View→Show Toolbar. In the main pane (the leftmost pane), type in your first guess at the code. Check the right-hand sidebar to see the result. The value shown, “1,” is correct. This is the correct number, and the quotes correctly indicate that the value is a string, as shown. Verify the result by adding another line. Check the result in the sidebar, as shown. Note that this new value is an Int and not a String, which you can tell by the absence of quotes.